django-dash (later on named Dash) is a customisable, modular dashboard application framework for Django. Dash allows users to create their own custom dashboards. Supports theming (in Dash themes are called layouts) and multiple workspaces. Dash comes with extensive pythonic API which allows developers to create new Dash plugins, as well as to modify bundled ones. To make a clearer association, think of Android for tablets (shortcuts, widgets and apps) or Windows 8 for tablets or desktops. Dash inherits all those concepts and makes it possible to implement a dashboard system for Django applications with minimal efforts. Core and plugins that don’t rely on third-party Django apps seem to work well with Django 1.6 (Selenium tests pass), although Django 1.6 is not yet proclaimed to be flawlessly supported by Dash. There might be multiple themes implemented and installed, but only one can be active for a certain user. Default layout is chosen system wide, but each user (if has an appropriate permission) can choose his preferred layout. Placeholder is a space, in which the plugin widgets are placed. Placeholders are rectangles consisting of cells. 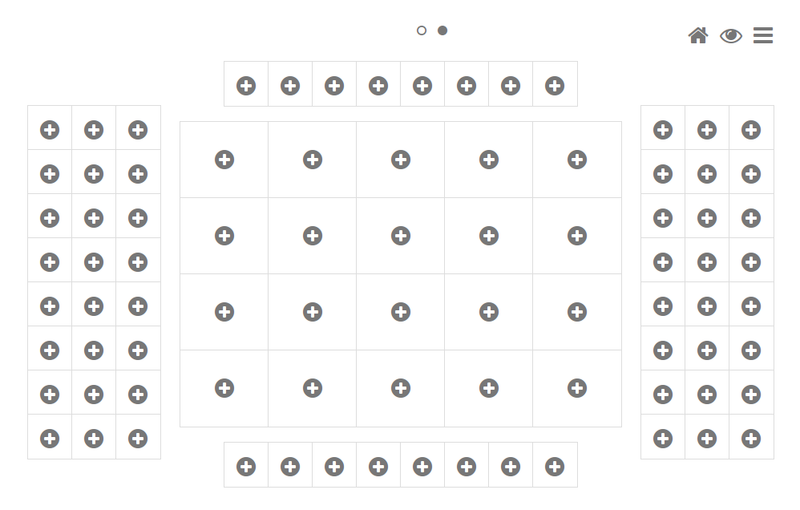 Each placeholder has its’ own custom number of rows and columns. Workspace is just another named dashboard. Users switch between workspaces in navigation. Amount of workspaces is unlimited. Plugin is a (Django) micro app. Most heavy work should happen in plugin. Plugin may have its’ own views, urls, etc. Rendering happens with use of plugin widgets. 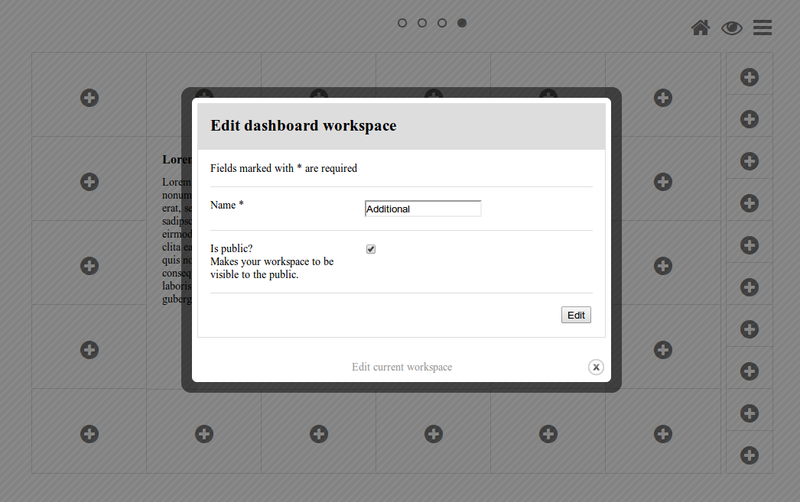 Public dashboard (implemented as a contrib app, which makes it optional) allows users to make their workspaces public. If user chooses to make his dashboard public, default workspace becomes public. As for non-default workspaces, user can still make each of them private or public. Tunable access permissions to plugins. Public dashboards (as a contrib app). Add dash to INSTALLED_APPS of the your projects’ Django settings. Furthermore, all layouts and plugins to be used, shall be added to the INSTALLED_APPS as well. Make sure that django.core.context_processors.request is in TEMPLATE_CONTEXT_PROCESSORS. In order to be able to quickly evaluate the django-dash , a demo app (with a quick installer) has been created (works on Ubuntu/Debian, may work on other Linux systems as well, although not guaranteed). Follow the instructions below for having the demo running within a minute. Open your browser and test the app. If quick installer doesn’t work for you, see the manual steps on running the example project (https://github.com/barseghyanartur/django-dash/tree/stable/example). Take a look at the templates in “example/example/templates” directory for getting a better idea of how to transform your own- or thirdy-part- templates into Dash templates. Also, the example project (https://github.com/barseghyanartur/django-dash/tree/stable/example/example/foo) has example layouts, plugins and widgets implemented. Take it as a good example of how to add widgets for existing plugins to your own customly made layout. Dash comes with several bundled layouts. Do check their source code as example. Let’s say, our imaginary layout has two placeholders. One large placeholder for all kinds of widgets (called main ) and a tiny one for shortcuts (called shortcuts ). Placeholder main consts of cells from 11 to 56. Placeholder shortcuts consists of cells from 1 to 10. A single plugin widget may occupy one or more cells. Plugin widgets are rectangles. Plugin widget has 2 cols and 1 row. Then, for example, it may occupy cells (11 and 12). Plugin widget has 2 cols and 2 rows. Then, for example, it may occupy cells (11, 12, 21 and 22). Plugin widget has 1 col and 3 rows. Then, for example, it may occupy cells (11, 21 and 31). Plugin widget has 4 cols and 3 rows. Then, for example, it may occupy cells (22, 23, 24, 25, 32, 33, 34, 35, 42, 43, 44 and 45). There are some rules/guideles you should follow. Let’s assume that layout is named example . The layout directory should then have the following structure. Layout and placeholder classes should be placed in the dash_layouts.py file. Each layout should be put into the INSTALLED_APPS of your Django projects’ settings module. Step by step review of a how to create and register a layout and placeholders. Note, that Dash autodiscovers your layouts by name of the file dash_layouts.py . The module, in which the layouts are defined, has to be named dash_layouts.py . >>>    uid = 'main' # Unique ID of the placeholder. >>>    cols = 6 # Number of columns in the placeholder. >>>    rows = 5 # Number of rows in the placeholder. >>>    cell_width = 150 # Width of a single cell in the placeholder. >>>    cell_height = 110 # Height of a single cell in the placeholder. >>>     uid = 'shortcuts' # UID of the placeholder. >>>     cols = 1 # Number of columns in the placeholder. >>>     rows = 10 # Number of rows in the placeholder. >>>     cell_width = 60 # Width of a single cell in the placeholder. >>>     cell_height = 55 # Height of a single cell in the placeholder. Defining and registering the Layout. >>>     uid = 'example' # Layout UID. >>>     name = 'Example' # Layout name. >>>     # View template. Master template used in view mode. >>>     # Edit template. Master template used in edit mode. >>>     # order specified here. >>>     # 'em' or '%'. In the ``ExampleMainPlaceholder`` cell_width is set to 150. >>>     #  It means that in this particular case its' actual width would be `150px`. >>>     # Layout specific CSS. >>>     # Layout specific JS. >>> # Registering the layout. You custom layout should be interited from base layout templates (view or edit). Both view and edit layouts share a lot of things, still edit layout is a bit more “heavy”. 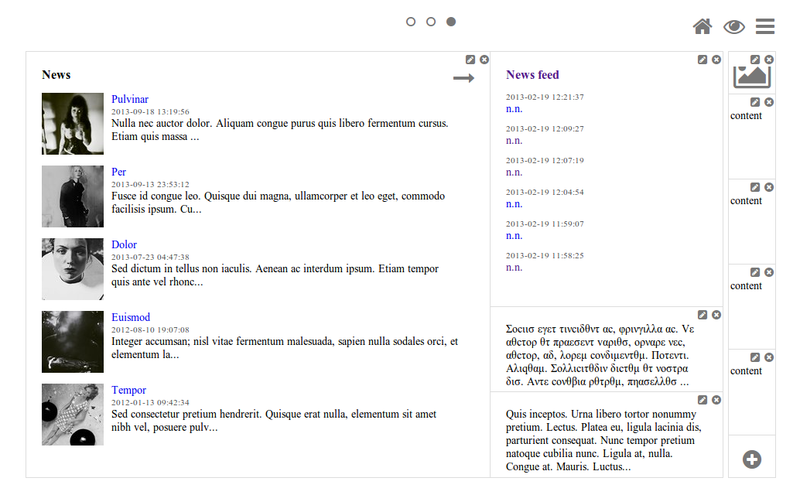 view_layout.html should inherit from “dash/layouts/base_view_layout.html”. edit_layout.html should inherit from “dash/layouts/base_edit_layout.html”. Both “dash/layouts/base_view_layout.html” and “dash/layouts/base_edit_layout.html” inherit from “dash/layouts/base_layout.html”, which in its’ turn inherits from “dash/base.html”. Note, that when rendered to HTML, each Dash template, gets a body class “layout” + layouts’ unique identifier (UID). 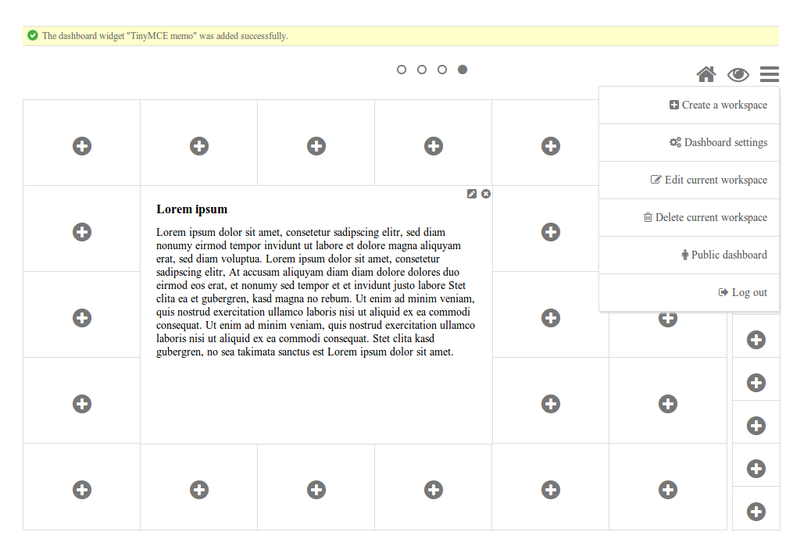 So, the ExampleLayout layout would automatically get the class “layout-example”. In case of Android layout (UID “android”) it would be as follows. Base your layout specific custom CSS on presence of those classes. Same goes for Placeholders. Each placeholder gets id_ + placeholders’ UID and the classes “placeholder” and “placeholder-” + placeholders’ UID. So, the ExampleMainPlaceholder would look as follows. And the ExampleShortcutsPlaceholder placeholder would look as follows. Same goes for plugin widgets. Apart from some other classes that each plugin widget would get for positioning, it gets the “plugin” and “plugin-” + plugin UID. See the following example (for the plugin Dummy with UID “dummy”). Each plugin also gets an automatic UID on the moment when rendered. In the example below it’s the “p6d06f17d-e142-4f45-b9c1-893c38fc2b01”. Layout, placeholder, plugin and plugin widget have properties for getting their HTML specific classes and IDs. Dash comes with several bundled plugins. Do check their source code as example. Making of a plugin or a plugin widget is quite simple, although there are some rules/guideles you should follow. Let’s assume that plugin is named sample_memo . The plugin directory should then have the following structure. Note, that you are advised to prefix all your plugin specific media files with dash_plugin_ for the sake of common sense. In some cases, you would need plugin specific overridable settings (see dash.contrib.plugins.weather plugin as an example. You are advised to write your settings in such a way, that variables of your Django project settings module would have DASH_PLUGIN_ prefix. Step by step review of a how to create and register a plugin and plugin widgets. Note, that Dash autodiscovers your plugins if you place them into a file named dash_plugins.py of any Django app listed in INSTALLED_APPS of your Django projects’ settings module. Defining the Sample Memo plugin. Registering the Sample Memo plugin. Plugin widgets are defined in dash_widgets.py module (described later), but registered in the dash_plugins.py , which is autodiscovered by Dash. Registering the Sample Memo plugin widgets for Layout example . Why to have another file for defining widgets? Just to keep the code clean and less messy, although you could perfectly define all your plugin widgets in the module dash_plugins.py , it’s recommended to keep it separate. Take into consideration, that dash_widgets.py is not an autodiscovered file pattern. All your plugin widgets should be registered in modules named dash_plugins.py . 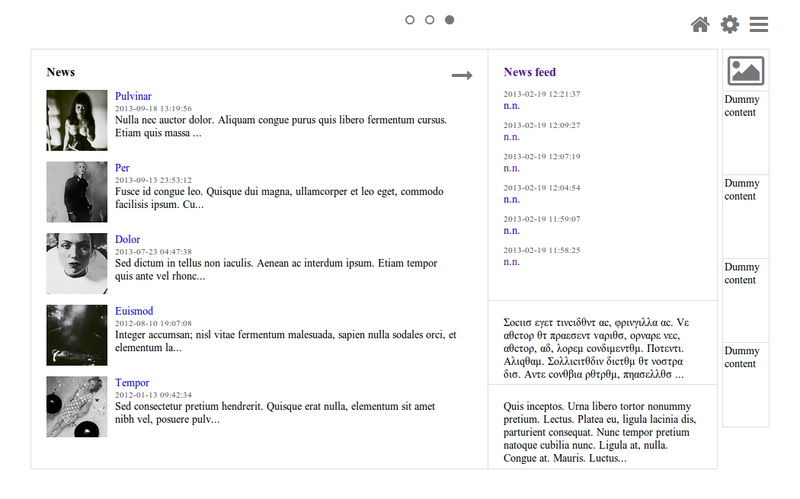 Memo plugin widget for Example layout (Placeholder main ). Memo plugin widget for Example layout (Placeholder shortcuts ). Memo form (for Sample Memo plugin). Now, that everything is ready, make sure your that both layout and the plugin modules are added to INSTALLED_APPS for your projects’ Django settings. After it’s done, go to terminal and type the following command. If your HTTP server is running, you would then be able to access your dashboard. Note, that you have to be logged in, in order to use the dashboard. If your new plugin doesn’t appear, set the DASH_DEBUG to True in your Django’s local settings module, re-run your code and check console for error notifications. Plugin system allows administrators to specify the access rights to every plugin. Dash permissions are based on Django Users and User Groups. Access rights are managable via Django admin (/administration/dash/dashboardplugin/). Note, that your admin URL prefix may vary from the one given in example (it’s usually “/admin/”, while in example it’s “/administration/”). If user doesn’t have the rights to access plugin, it doesn’t appear on his dashboard even if has been added to it (imagine, you have once granted the right to use the news plugin to all users, but later on decided to limit it to Staff members group only). Note, that superusers have access to all plugins. There are several management commands. dash_find_broken_dashboard_entries . Find broken dashboard entries that occur when some plugin which did exist in the system, no longer exists. dash_sync_plugins . Should be ran each time a new plugin is being added to the Dash. dash_update_plugin_data . A mechanism to update existing plugin data in case if it had become invalid after a change in a plugin. In order for it to work, each plugin should implement and update method, in which the data update happens. DASH_RESTRICT_PLUGIN_ACCESS (bool): If set to True, (Django) permission system for dash plugins is enabled. Defaults to True. Setting this to False makes all plugins available for all users. DASH_ACTIVE_LAYOUT (str): Active (default) layout UID. Defaults to “android”. DASH_LAYOUT_CELL_UNITS (str): Allowed values for layout cell units. Defaults to (“em”, “px”, “pt”, “%”). DASH_DISPLAY_AUTH_LINK (bool): If set to True, the log out link is shown in the Dash drop-down menu. Defaults to True. For tuning of specific contrib plugin, see the docs in the plugin directory. Font Awesome is used for icons. As a convension, all icons of font-awesome are placed within a span. Next to their original class, they all should be getting an extra class “iconic”. Follow that rule when making a new layout or a plugin (HTML). It allows to make the styling easy, since icon colours could be then changed within no time. Dash ships with number of bundled (demo) plugins and layouts that are mainly made to demonstrate its’ abilities. 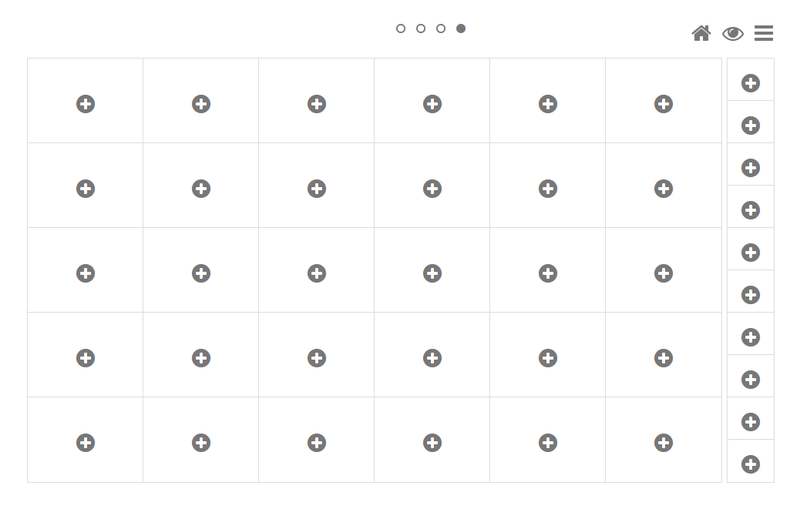 In order to work amoung various layouts (themes), each plugin has a single widget registered for a single layout. It’s possible to unregister a bundled widget and replace it with a custom one. Below a short overview of the plugins. See the README.rst file in directory of each plugin for details. Below a short overview of the layouts. See the README.rst file in directory of each layout for details. Although you are free to name your plugins and widgets as you want (except that you should comply with PEP http://www.python.org/dev/peps/pep-0008/#function-names), there are some naming conventions introduced, that you are recommended to follow. Several screenshots of Android layout are presented below. Dashboard workspace (edit mode), which is a edit mode of the previous dashboard workspace. Dashboard workspace (edit mode) is an empty dashboard workspace in edit mode. Choose widget to added to the dashboard workspace. 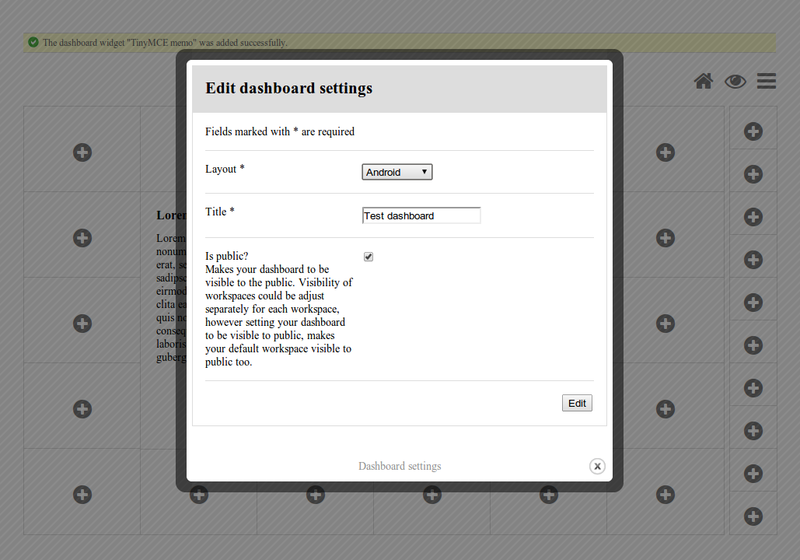 Dashboard workspace (edit mode) on which the TinyMCE plugin widget has been just added. Menu is unfolded. A form to edit global dashboard settings. A form to edit settings of current dashboard workspace. Several screenshots of Example layout are presented below. Dashboard workspace (edit mode) - previous dashboard workspace was filled with images. © Copyright 2013, Artur Barseghyan <artur.barseghyan@gmail.com>.